Totalbiscuit liked Skullgirls and Chroma Squad and was ok with Deadlight (platformers were not his bag). I think this bundle has been available for a while without being explicitly listed on HUKD. Skullgirls is 62p with the code‌ SUMMER10 separately. Deadlight is free with the Humble Monthly Trove (£9.22). Chroma Squad, Skullgirls and The Way are certainly worth(more than) 55p each so it's a steal already! 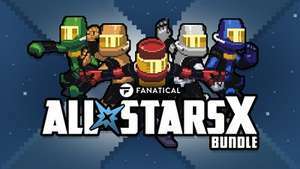 Pretty much all of Fanatical's bundles atm are worth picking up. Siege, Awesome, Fantasy, Killer Bundle XI, Fully Loaded 4.
what an amazing deal, heat!